Is This That Magical फव्वारा या Doris's Habitat?. HAAAAA! It appears that I was right all along! 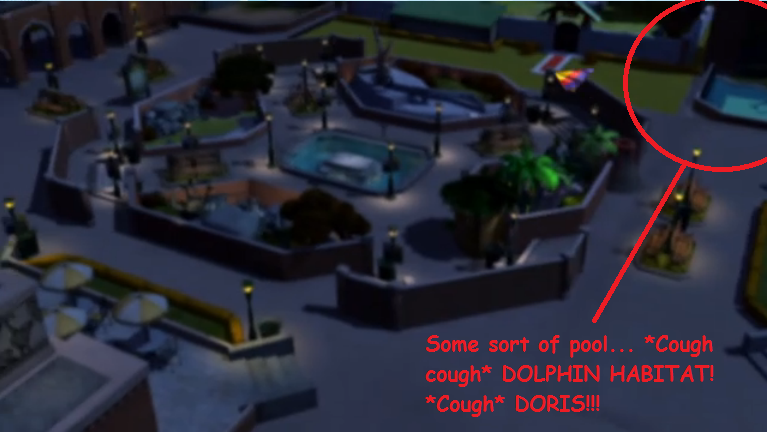 There is an aquatic (dolphin द्वारा my guess XD) habitat! :D. Wallpaper and background images in the पेंग्विन्स ऑफ मॅडगास्कर club tagged: penguins of madagascar picture habitat doris dolphin that. This पेंग्विन्स ऑफ मॅडगास्कर photo contains व्यापार जिले, शहर, व्यापार जिला, and डाउनटाउन. There might also be रिसॉर्ट, रिसॉर्ट होटल, छुट्टी सहारा, छुट्टी रिसॉर्ट, टर्नटेबल, turntable, रिसॉर्ट होटल, स्पा, and रिज़ॉर्ट होटल. I thought it was a fountain. It could be doris's habitat. I don't know. That might just be the fountain, but it doesn't show enough to be sure. Either way, I don't know you noticed something so small and crouched up in the corner of the screen. Nice catch! I know there's Bada and Bing on one corner, Burt on another, and I think Joey on the third, which leaves one more... Huh, maybe that really IS Doris's habitat. ^I don't think it's the polar bear habitat either, becuase that's supposed to be on the left of the Zoovenier shop. Looks a little small to be a habitat but hey, who knows. Maybe Doris is smaller then we all think for all we know. ^Yea, that keeps bugging me on how it's not very big or "decorative." Why would a dolphin habitat be in that corner despite it's surroundings? I mean, at least a dolphin tank would be good. He'd be like: I'm a hippo.... rawr. XD Well, probably not, but a hippo would still be cool! ^Omigosh I think you're right...... *Victory dance* YES!!! HAHAHA! YEEES! :D ....Ok, I'm back to normal again! :O Also you can see the Childrens ZOO! remember that? ( in the line of doody XD haha) I will now forever hate myself for saying this : IS.... is dorski true!?!?!?!?!? DX I HATE MYSELF NOW! Fact 1: Kowalski loves Doris. Fact 2: Skipper said Doris only likes Kowalski, not "likes likes" him. Fact 3: Skipper had some sort of dream about Doris, and said in his sleep, "No... no Doris. Kowalski must never know..."
Fact 4: Stated from the poem, Kowalski was swimming with Doris, and held her flipper. Apparently, Doris said she wanted someone hipper and left him. Aren't dolphin habitats supposed to be deep and wide? On the poem when i first heard that Doris wanted someone hipper and a penguin that we know of who's name rymes with hipper. Then said penguin has a dream of Doris..
YOU FOUND IT BLUE!!! YOU FOUND DORIS' HABITAT!!! YYAAAAYYY!!! 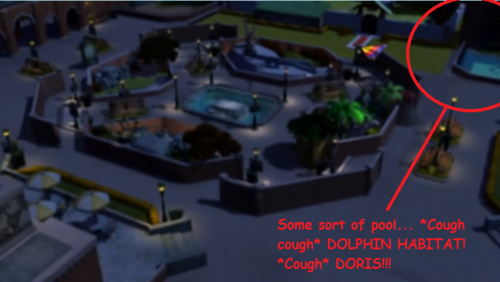 hemmmm,is dolphin live in that small habitat? but....i think,maybe that is doris habitat! @BluePenguin That Pic In The Corner Is Doris Habitat? OMG! ZOMG! WTF! DX * sad sigh* what did i bring up back there?!?!!? So where Doris lives. I'm sure Kowalski would love to visit there. ... if Roger is in one corner of the habitat, Joey in another corner, Bada and Bing in another, and Burt in the last corner, then where is Doris? Is Dorski really true? Hope so. Doris lives in the ocean. Haven't u seen it in "Loathe at first sight"?